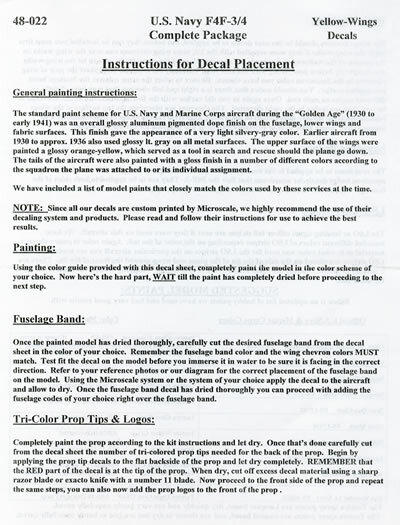 Conclusion: This is a great sheet from Yellow-Wing Decals. It provides you with excellent quality and complete markings for three aircraft as well as comprehensive support information to enable you to replicate them in 1/48 scale. 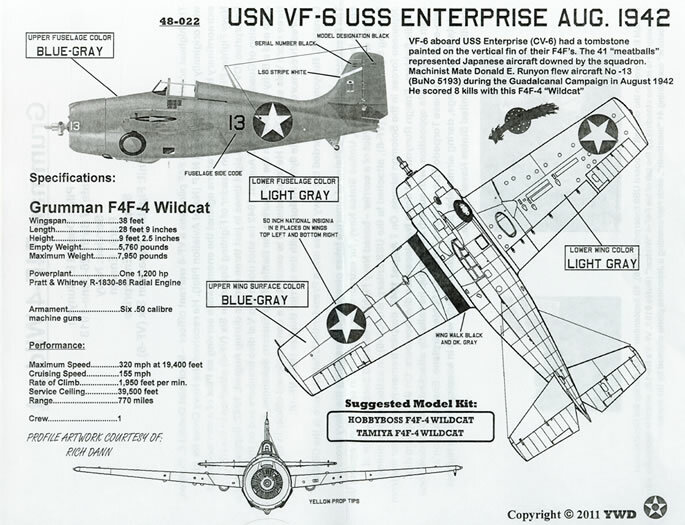 USN F4F-3/4 “Wildcat” is a new sheet from Wayne Teflin’s Yellow Wings Decals. 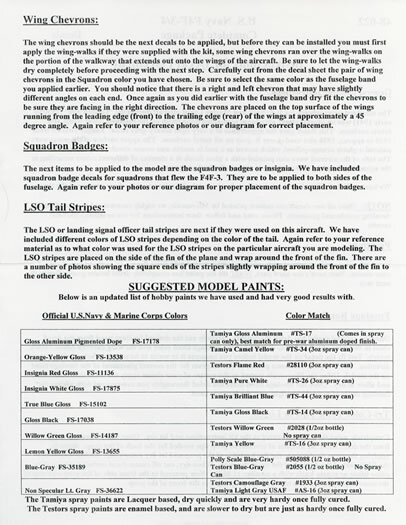 This time Yellow Wings have broken with their tradition of providing generic sheets from which you have to take decals from several different sheets to make up the markings for an aircraft and has produced a sheet that carries everything you need to produce three different machines on the one sheet. F4F-4 Bureau number 5193 flown by Warrant Officer Donald E. Runyon of VF-6 embarked aboard the U.S.S. Enterprise in August of 1942. The machine is in blue grey over light grey camouflage finish and sports a white Landing Signal Officer stripe on the vertical stabiliser as well as (unusual for a U.S. Navy aircraft) artwork on the vertical stabiliser in the form of a “tombstone” that carries VF-6s’ score at that time of 41 “meatballs” indicating their victories over Japanese aircraft. Other markings include the aircraft’s modex number 13 in black for the fuselage and tops of the wings and in white for the cowling. Tiny aircraft’s designation and bureau number, the pilot’s individual score card of eight rising sun flags, and the yellow tips for the propeller blades. A complete set of national insignia rounds out the markings. F4F-3 Bureau number 1865 of VF-41 embarked aboard the U.S.S Ranger in early 1941. The aircraft is finished in the pre-war “yellow wings’ scheme of painted aluminium fuselage and lower wings, orange-yellow upper wings, willow green vertical and horizontal stabilisers (indicating that it was an aircraft assigned to the U.S.S Ranger). 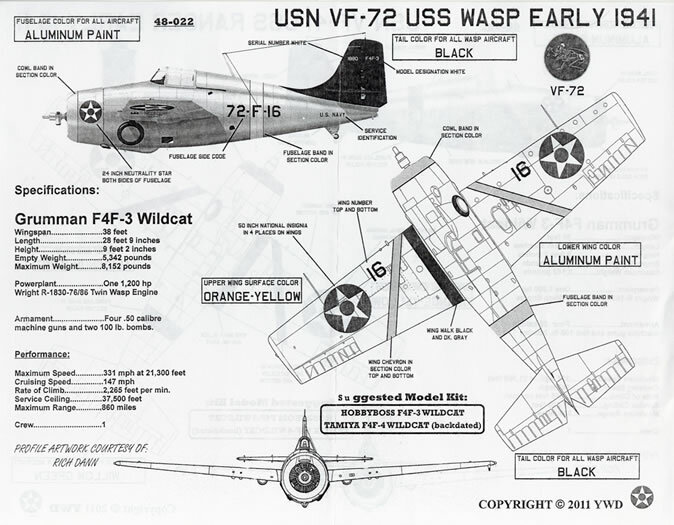 The supplied decals include black edged red bands for the fuselage and wings (indicating that it was an aircraft assigned to the first section), aircraft designation and bureau number, fuselage code numbers, red, yellow and blue prop tips, black wing walks, thin black (and white) pin stripes – this is so you can add them to the edge of the cowling front when you paint it red to match the fuselage and wing stripes. 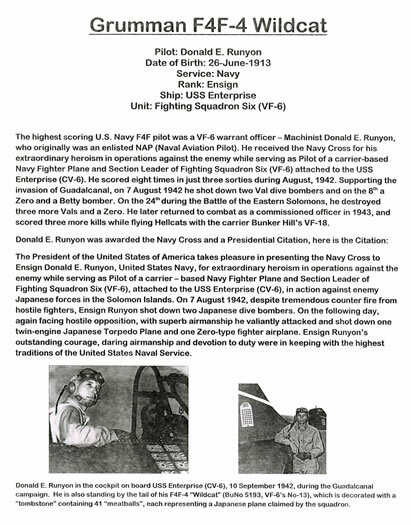 Also included are four VF-41 squadron insignia, and a complete set of national insignia. VF-72 squadron insignia, and a complete set of national insignia. The decals themselves have been printed by the Microscale. They are well up to Microscale’s high standards being thinly printed with an absolute minimum of carrier film. 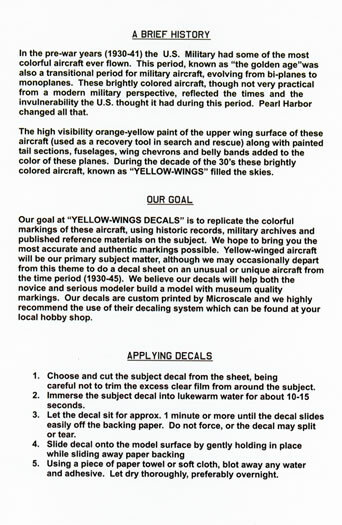 As with all Yellow-Wings Decals products, comprehensive support information is provided along with the decal sheet. You get three A-4 sized sheets that are printed on both sides. Individual side and lower surface plan views are provided for each option to give you an idea of where to place the decals as well as providing info on the paint scheme. 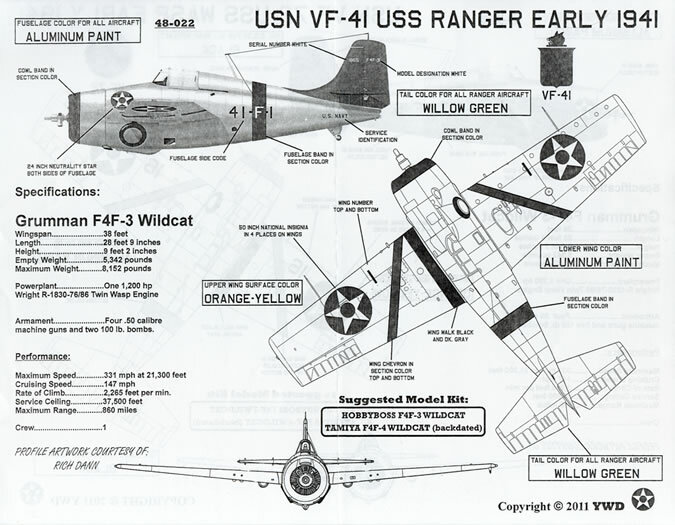 You also get detailed information on the painting of USN/USMC machines between 1930 and 1941 as well as instructions for the sequence of the application of the decals themselves and a chart that suggest matches paints of the era to readily available model paints – Tamiya, Testors and Polly Scale. The decals and information sheets come packed in a clear plastic zip-loc bag along with a stiff header card to save everything from being bent. 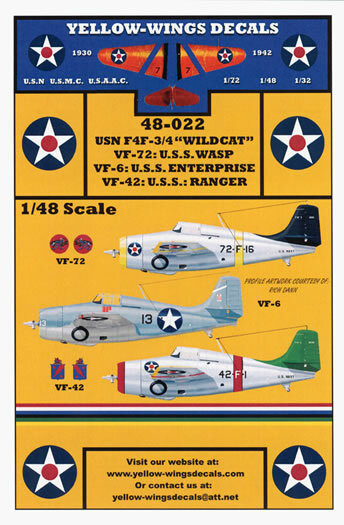 The recommended kits are the Hobby Boss F4F-3 (early Version) and the Tamiya F4F-4 suitably back-dated to F4F-3 standard. 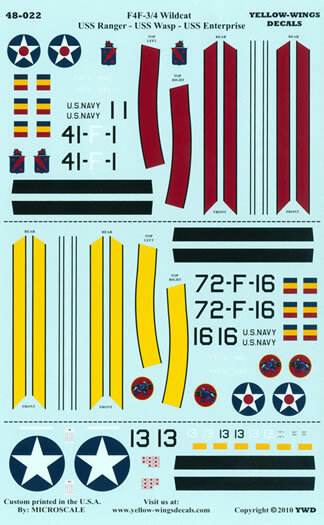 This is a great sheet from Yellow-Wing Decals. It provides you with excellent quality and complete markings for three aircraft as well as comprehensive support information to enable you to replicate them in 1/48 scale.